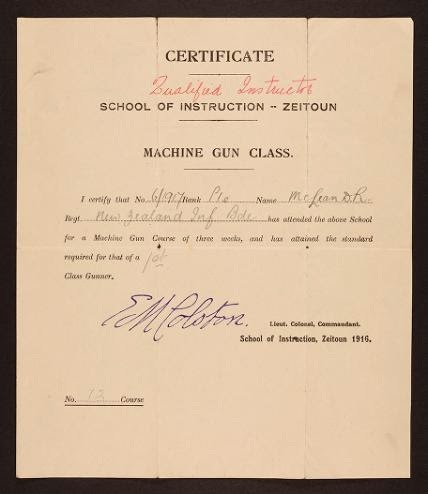 I have been down here for about three weeks at the School of Instruction going through a course on the Machine Gun. We return to our units at Ismailia tomorrow. I have managed to get through the examinations here with an average of 95% this gives me an instructors certificate and I will probably have the opportunity of stopping as an instructor if I feel so inclined. It would be a soft job 3 weeks work and the one week's holiday but I don't think I will take it on as it would mean leaving my unit a thing I would not care to do after being with it for so long. While I have been here I have been able to go out to the Pyramids and look around generally. We have had no N.Z. mail for over six weeks but there should be some letters for us in camp when we return. I ran across Stanley Green in Cairo the other day. He was hit in the August advance and now has a job at the base here. Gordon when I saw him last was looking in great form.